You can create and control your own private Internet world! AltME makes you Worldmaster with the power to create a world, control who can visit, and what they can do during their stay. The Start Your Own Safe World panel appears. Think of a name for your world. It needs to be different from all other world names because no one else on earth can have the same world name as you. All extra spaces are ignored. Type a password that only you can remember. For passwords, capital letters are different than lower case letters. IMPORTANT: Make a password that only you can remember. AltME will now check the World Name Server to see if anyone else has taken the name. If the name is taken, try again until you find a name that works. Type the password again to confirm that you want to create the world. Safeworlds will be emailing important information about features and upgrades to Worldmasters. To receive these emails type an email address into the box. Now you must make an important decision. For a small fee you can keep your world name safe for a year. WARNING: You can lose your world if you don't use it! You must start your world at least every 10 days (or keep it running all the time), or you will lose your world name. If that happens, nobody will be able to connect to your world, and someone else can take your world name. You can keep your world safe for a small fee. Now you are ready to start your world server. Write down your initial Username and Password. As long as you are connected to the Internet and the world is running, people can visit your world. Now you can invite others to join your world. 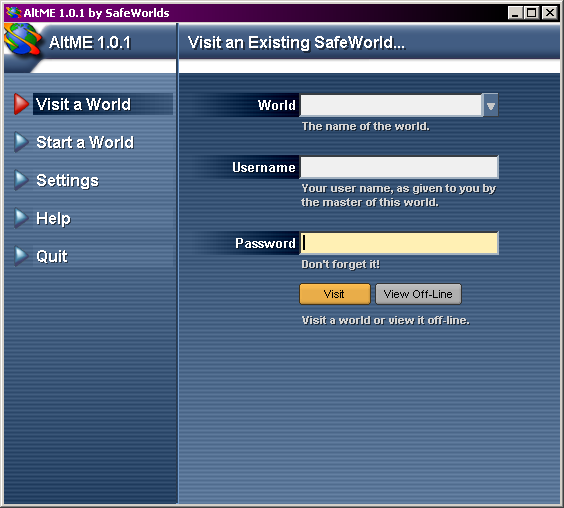 After your world is started, AltME puts you in the Visit A World screen so you can logon as worldmaster. Type in your Worldmaster username and password. Congratulations Worldmaster! You are all alone in your private world. You need to invite others to join you. Your friends must have a User Name and Password to join your world. You must create a user account for them. The Add New User window appears. 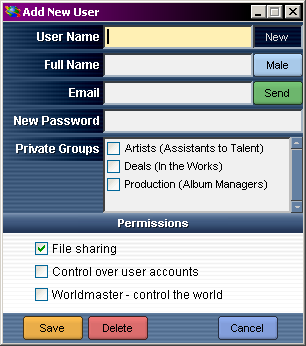 You must give each user a name and a password, choose the groups they can join, and decide if you want them to be able to invite users into your world. You can even give them Worldmaster powers. User Name: Each person in your world must have a different name. You can change the name at any time. The visitor can also change it, but there can never be two people with the same name. Full Name: You can also enter a full name for the person. Sometimes people want to use a screen name. By entering a real name everyone can tell who they really are. Gender: Click on the male/female toggle button to set the user's gender. Email: You can invite a person to join your world by sending them an email. Put their email address here. New Password: To visit your world, they must have a password. Type it here, and type it again to confirm it. They can change the password on their next visit. Even a Worldmaster doesn't know what it is. Of course you can change it at any time if you don't want them around for a while. 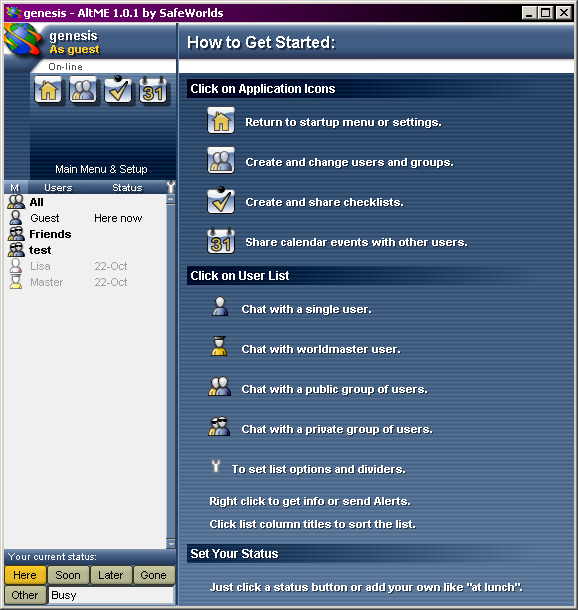 Groups: All users are normally included in the All group. You can also make groups that are private. You can decide who can be a member of a private group. Permissions allow you to control what the visitor can do while visiting your world. File sharing allows the person to send and receive files from others in the world. Control over user accounts allows the person to create user accounts and invite others into your world. Worldmaster - control the world gives a person complete control over the world. They can even destroy the world itself if they decide to do so. Only give Worldmaster powers to those you trust completely. Most worlds will have only one Worldmaster. 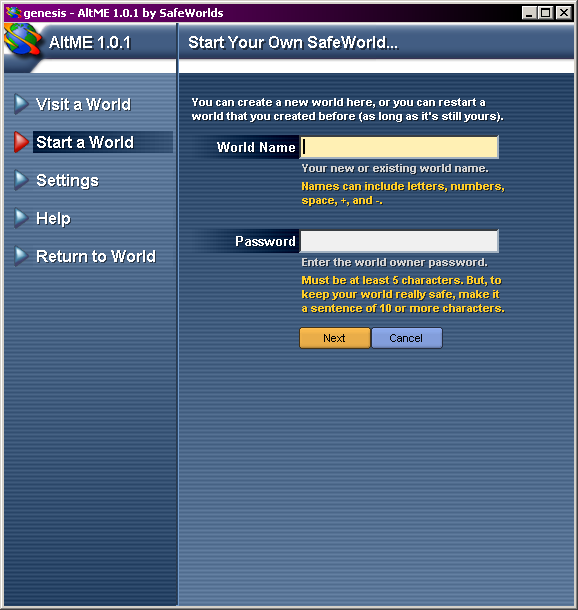 AltME will ask you if you want to send an email inviting them to join your world. There are lots of ways to invite people to join your world. Put AltME on a floppy disk and give it to them. Call them on the phone and give them their account information. Email them with their account information. Have others who are already part of your world invite people to join.